We’re closing in on the release of Convergence Server Enterprise, the dramatically updated version of our Convergence Server Learning Management System. As we make the final preparations for launch, we’d like to take the opportunity to break down some of the key features of Convergence Server Enterprise, and to show you just what it is that sets our new LMS apart from the rest. The most apparent improvements to Convergence Server Enterprise are the new, graphics-rich user interface and gloriously refined organizational structure of the application as a whole. A lot of care went into making Convergence Server Enterprise perform faster and more efficiently. Not only that, we wanted it to feel faster. And boy, does it ever. From the convenience of the fixed menu, to the carefully considered visual design, to the helpfully placed breadcrumb navigation – This is the smartest, fastest, most versatile learning management system on the market. Single-page feel. No getting lost in popup after popup. Much has been done to support the new multi-site capability of Convergence Server Enterprise. The old application’s basic, sometimes difficult method of defining and maintaining training groups has been transformed into a robust and flexible system that is easy to maintain from the corporate office all the way down to the individual user. Convergence Server Enterprise uses a new “Library” model that allows administrators to quickly and easily organize large quantities of training objects. 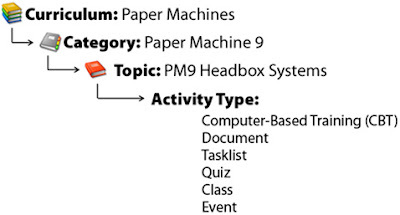 Training objects (courses, documents, tasks, etc) are grouped into Activities, Categories and Curricula. Once your library is organized, it will be easy to assign training using our new “Qualifications”. Convergence Server Enterprise establishes qualifications as a single entity that may contain multiple requirements. 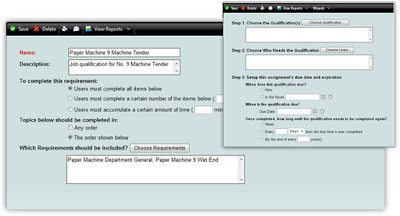 For instance, to qualify to operate Paper Machine #9, you may require that an employee completes 4 separate requirements. 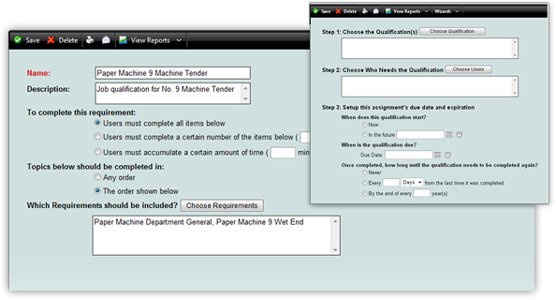 To be considered “Qualified”, you can designate the number of items that must be completed, or the amount of training time that must be accumulated. Once your Qualifications have been created, they can be assigned to any level of your organization with customized schedules, due dates, and expiration dates. 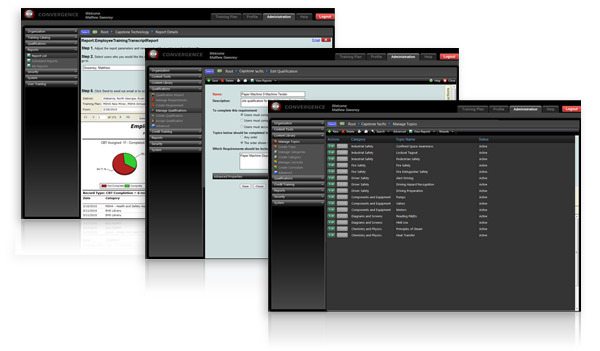 Convergence Server Enterprise includes a much more flexible engine for handling system-wide administrative permissions. Permissions can be assigned at any level in the organization, including directly to individual users, and can be configured so managers’ read/write permissions are restricted to profiles and reports belonging to their department only. The system can accommodate very complex custom configurations, and several pre-configured roles will also be available out of the box. Context-based permissions handling. 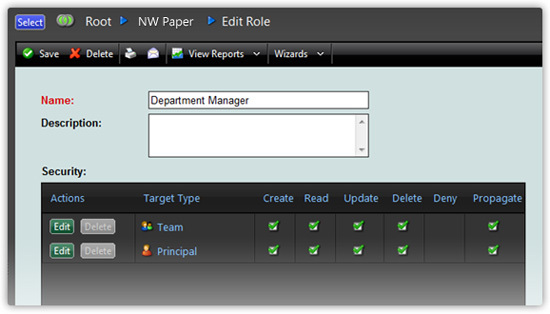 Set permissions by user, by department, or by site. 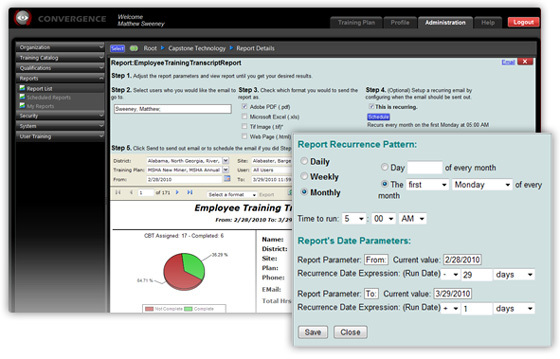 The reporting functions in Convergence Server Enterprise have been have been re-imagined and re-designed to provide greater speed and flexibility in communicating employee progress. Select your employees, choose a report format, and generate transcripts that detail employee progress in the completion of assigned courses, classes and tasks. 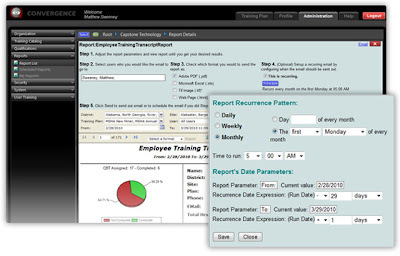 Program the report to go out once, or at daily, weekly, or monthly intervals. There you have it – a breakdown of some of the exciting new features of Convergence Server Enterprise. There will be more to come as we continue moving forward toward release, but, in the meantime, feel free to leave us feedback here on the blog, or contact us directly regarding any questions you may have about Convergence Server Enterprise. Visit Convergence at the 2010 ASSE Safety Expo in Baltimore for a chance to WIN an iPad! 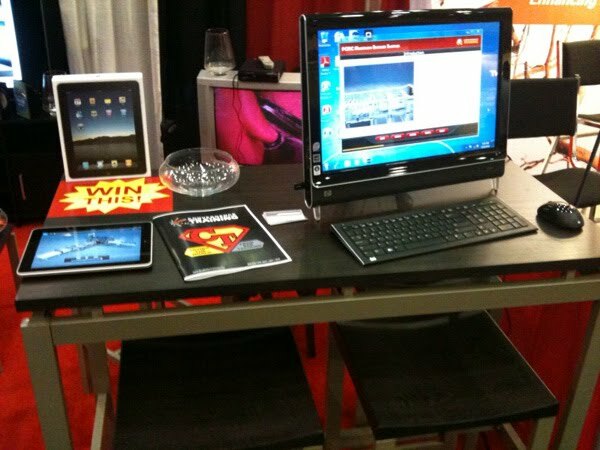 Come visit Convergence Training (booth #2554) at the ASSE Safety 2010 Expo in the Baltimore Convention Center from June 13th through the 15th, 2010 and you just could win an iPad or one of several other cool prizes. Here at Convergence Training, we work on a pretty tight schedule. With loads of custom training projects in production, our writers are busy scripting and storyboarding and our artists are hard at work modeling and designing the dynamic 3D courses we’re so proud to produce. At the same time, we’re continuing to build our retail safety and compliance library. At a recent planning meeting, we developed a diverse list of candidates for production in the coming months. But now we need your help. Since we can’t make all these courses at once, we’d love to hear what you think. What’s on our list that you need the most? Anything not on the list that you’d like to see us put our spin on? Take the poll or leave a comment and let us know what you’d like to see next. While Convergence Server Enterprise has provided training administrators with powerful training delivery, tracking, and reporting tools, we think we can offer our clients more. In Convergence Server Enterprise, we’ve retained the core functionality of the original system while reworking the entire platform to be more flexible, more intuitive, and much more powerful. We’ve also added multi-site capability, increased the customization options for training plans and training groups, and generally made the whole application bigger, better and faster. • New organizational structure and user interface. So that’s our brief introduction to Convergence Server Enterprise. We’ll be releasing more details as we approach our launch date, so check back here or subscribe to our RSS feed to receive future updates. We recently launched a new website to compliment our BuyBetterTraining.com online storefront. DriverSafetyVideos.com is focused exclusively on our line of Driver Safety Videos, and will allow us us a little more freedom to expand upon the themes of driver risk management, driver preparation, awareness, and accident prevention. 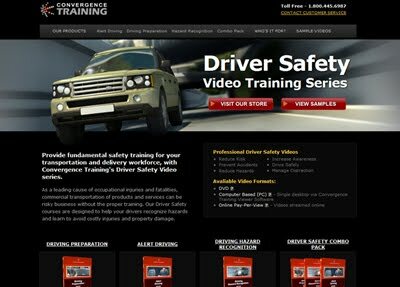 So, check out DriverSafetyVideos.com for your driver training needs, and keep an eye out for new product launches, articles, and information about how to reduce risk and injury to yourself or your employees. Convergence donating a portion of retail proceeds in support of familes affected by mine tragedy. Convergence Training joins the nation in mourning the loss of life at West Virginia’s Upper Big Branch mine. We extend our thoughts and prayers to the families and friends of all affected by this tragedy. As an organization dedicated to safety, we pledge to donate a portion of all retail proceeds from BuyBetterTraining.com through the end of May 2010 toward the support of affected miners and their families. Recipients and details will be announced at a later date and we’ll appreciate all suggestions for appropriate methods of effectively showing our support of our American mine workers. We’ve recently completed work on our new Hexavelent Chromium video and it’s now available for sale from BuyBetterTraining.com. Learn to how to comply with OSHA’s standards concerning monitoring and controlling exposure to cr6+, and understand how to keep yourself and your team safe when working with this known human carcinogen. Hexavalent Chromium, or Cr(VI), is used in many industrial processes and can often be found in steel production and metal working. Welders in particular are at risk for CR(VI) exposure; especially when arc welding or stick welding with stainless steel or chromium metal. The Hexavalent Chromium dust or gasses produced from heated metal attacks the airways, leading to nasal and skin ulcerations, lesions, respiratory ailments, and lung and nasal cancers. 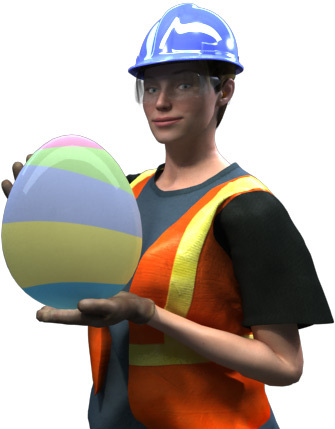 In Celebration of the changing of the seasons, we’re offering 20% off of our entire inventory of MSHA and safety training videos during the month of April. This bonus comes with a twist, however. To get the 20% discount, you must find the three eggs we’ve hidden throughout BuyBetterTraining.com. Find them all and put their words in order to form the right coupon code and save 20%. It’s as easy as 1-2-3! Visit BuyBetterTraining.com and Start Hunting. 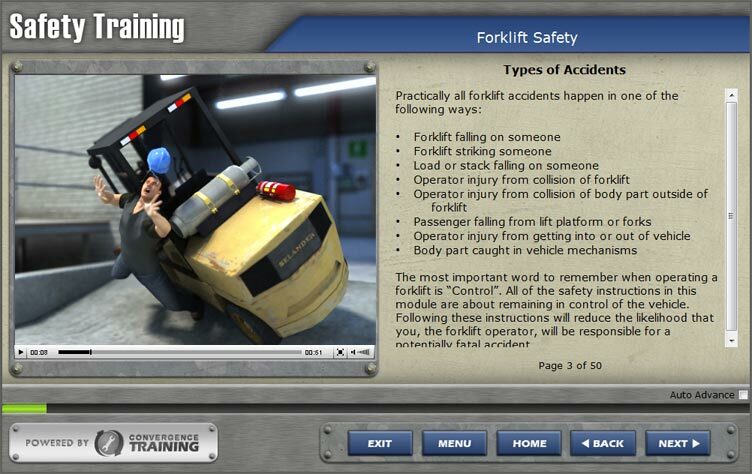 **Update**Our Forklift Safety Training video is now complete and available for sale. 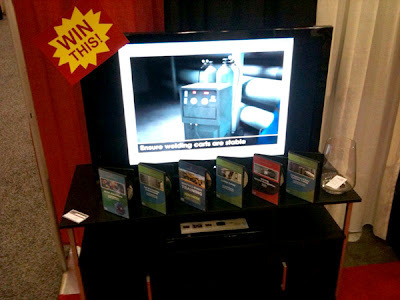 View a sample or buy the video from our website. 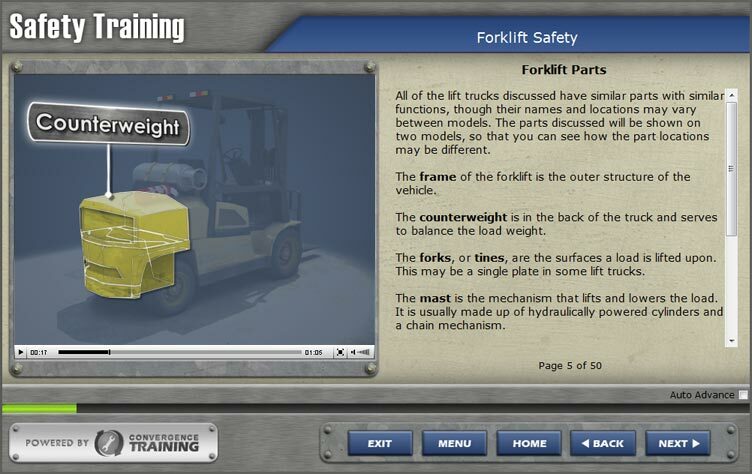 We’ve been hard at work on a Forklift Safety Training video to add to our library of safety training DVDs. We’re still adding some finishing touches, but we’re really excited about this one. It’s looking great! 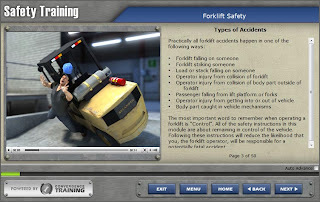 The video is designed to coach employees on how they can avoid accidents and injury while operating a forklift at work. It’s great for new employees, or as a refresher course for veteran workers. 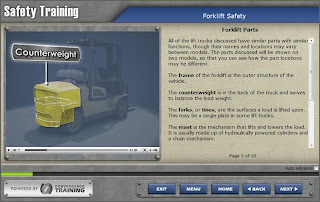 Teach speed, stability and safe operation of forklifts in any workplace. This time we’re in Columbia, South Carolina attending the Mining Association of South Carolina (MASC) 2010 Mining Workshop. Come visit us at booth #42, or during our breakout session were we will be demoing our award-winning MSHA training materials and compliance tools. As always we will also have our Environmental Health and Safety training courses available. Please mark your calendars for Tuesday, March 30 – Wednesday, March 31, 2010. The event will be held at The Radisson Hotel and Conference Center in Columbia, S.C. The Mining Association of South Carolina consists of individuals, firms and corporations whose common interest is development of mineral resources, in an environmentally sound manner, in the state of South Carolina. We advise and safeguard the business interests of our members through regulatory, legislative, public relations and educational programs. We promote harmony within our industry and with the general public consistent with high standards of responsibility, skill, and integrity. 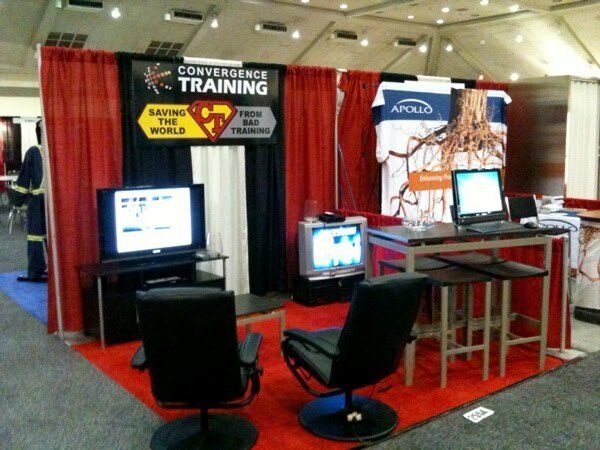 We recently took some time to retool the Convergence Training newsletter. In addition to the new coat of paint, we added some features and functionality that should help us to better spread the word about sales, events, and other goings-on at Convergence. Check out an archived version of the new design here. You can always view our archived newsletters here, or better yet, subscribe to the newsletter to be alerted to new Convergence products and discounts.